Visually manage end to end connectivity and cables in NetZoom™. The NetZoom Cable Library comes with many popular cable designs for easy identification. The NetZoom Cable Library offers all types of cables including power, copper, and fiber cables. Manage all types of copper and fiber connectivity and their cables. Standardize on cable models, cable information and cable lengths. When a connection is made, NetZoom auto-calculates the cable lengths and assigns the appropriate standard cable length. Users can Visualize end-to-end device connections as NetZoom maintains the connection status for each port and cable. 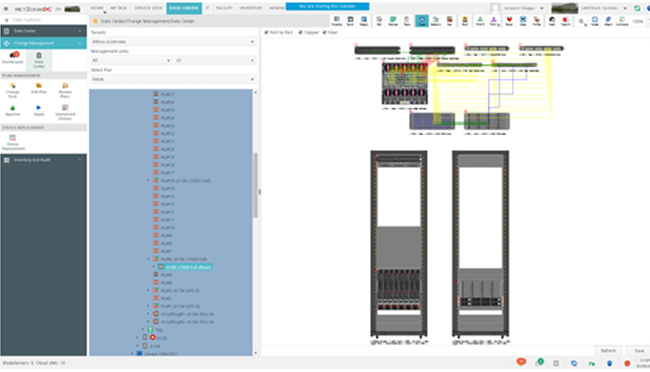 With NetZoom, users can both Visualize and Navigate the connectivity between different devices including patch panels and switches. Visually Plan, Connect, and Track power connectivity from a device through power devices like Rack PDU, power rail, Remote Power Panel and UPS all the way to main power source.